Start each day with a wonderful full breakfast to keep you going whether your plans take you to the beach, out snorkeling and diving, or touring the many shops, galleries and restaurants of Duval Street. When you've seen all you want to, simply "come home" and relax in our beautiful garden setting, in the sun or shade. Enjoy the subtle music... cool off with a dip in our pool... recharge yourself. As night falls enjoy a complimentary glass of wine as you unwind to make your evening plans. 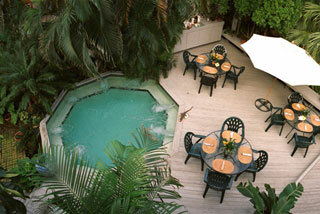 Experience the best of Key West.